The compilation includes four classic Sonic 16-bit platformers ported for the first time to Nintendo DS. Sonic The Hedgehog is playable, alongside the second and third games in the series and Sonic & Knuckles. All games have been optimised for Nintendo DS and include a few new features. This is a decent, if a little unremarkable, port of some memorable platformers that has actually got me in the mood for Sonic 4, the upcoming game from SEGA, which takes the blue hedgehog back to his 2D roots. This is a straight emulation of the four games and therefore presentation is extremely basic, with a simple menu screen allowing you to select the game you want. New features include the option to play as Knuckles in Sonic 2 or Sonic 3, some bonus video content and collectable images to unlock, plus a save 'anywhere' feature. The games are all better when you play as Sonic anyway, so the ability to play as Knuckles isn't particularly appealing, but the unlockables add an extra incentive for you to work your way through all four games; and may appeal to fans of these games first time around. The Save 'anywhere' feature isn't exactly what I thought it would be. Instead of being able to save anywhere you can simply save from the start of each Act. Nevertheless, it means you can save frequently and play all of the games in short bursts -- ideal for hand-held gaming. Having played the compilation on both the DSi and then the DSi XL, it’s a game that benefits a lot from the larger screens of the new revision -- it looks that little bit sharper and the colours more vivid. The resolution, however, has been scaled down from the Mega Drive days to cater for the limitations of the DS, so in some places it looks a little pixelated. Unless you go from playing these games on your Mega Drive or other plaforms, such as the Xbox Live Arcade, this will be barely noticeable. 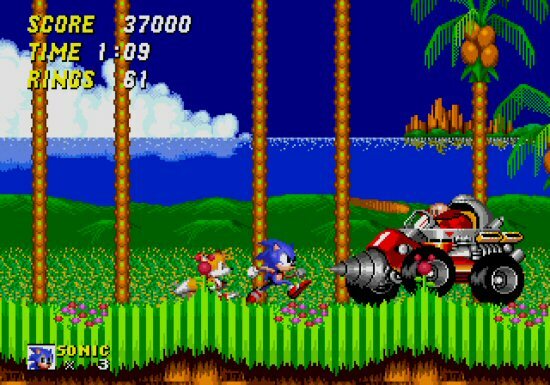 Sonic's ability to run, jump, and roll at high speeds collecting rings across some brilliantly designed levels hasn't lost any of its appeal. It's still as fun and addictive as it ever was and being able to play these games while on the move certainly merits its release. A great chance to play these classic games on the move. Still as much fun to play as ever. These are straight emulations of the original games, so don't expect upgraded presentation, or tons of new features. Resolution scaled down for DS. Data shows that tablets have overtaken Nintendo's 3DS for the first time. It's nice to be able to play these games anywhere. Was having a bash in bed (on the DS :)) last night and thoroughly enjoyed it too. Hahahaha .. old is gold! Same thing gets recycled again and again and again. I personally liked Sonic Adventure DX. It's nice to be able to play these games anywhere. Oohh, definitely not questioning that. But you can get a 20 game handheld “Megadrive” for < £30 now - and I imagine the DS Sonic pack is a bit more expensive than that**?